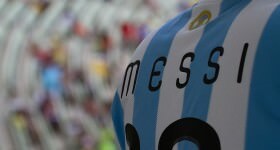 I’ve waxed lyrical about Lionel Messi on the Real Argentina before, even composing a rather ill-advised poem. In fact I was so gushing about him, now looking back at the series of World Cup posts, I noticed that I even included an exclamation mark. An exclamation mark! Ye gods! 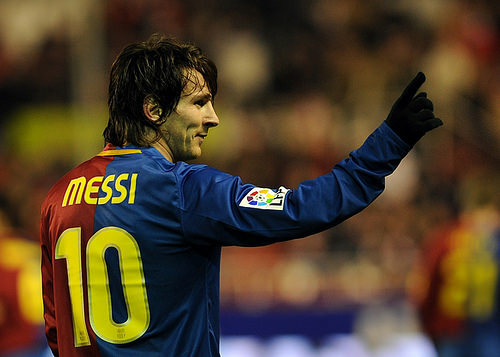 Is it any coincidence that Messi’s surname forms most of the word Messiah? At the age of 23 Lionel Andrés Messi is already one of the greats. Pele, Beckenbauer, Messi and, yes, Maradona. 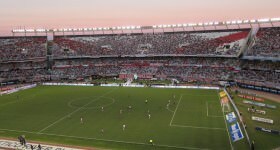 I first saw Lionel Messi play live in the Monumental, the national stadium and home to River Plate. It was the sort of day where news channels took to the streets and fried eggs on car bonnets (it was January and an unusually slow news day). In the vast Monumental (the cheap seats – no shade), 60,000 lethargic, sweating fans watched 22 lethargic, sweating players. 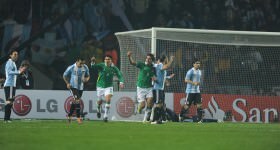 It was Argentina vs Bolivia in the World Cup qualifiers. The game never really got going in that heat and, with the exception of when the fire brigade took it upon themselves to spray the crowd with freezing water, the only time anyone stood up was when one man touched the ball: “Olé, Olé, Olé, Olé… Messi, Messi”. This was the man that Buenos Aires had turned out to see. Even during the game he showed flourishes of greatness. In his natural game, he barely passes above snail’s pace until he sniffs a goal, and this game he was even slower. But the moment he touches the ball, we all rise as he skips around the Bolivians with an effortless style and grace. 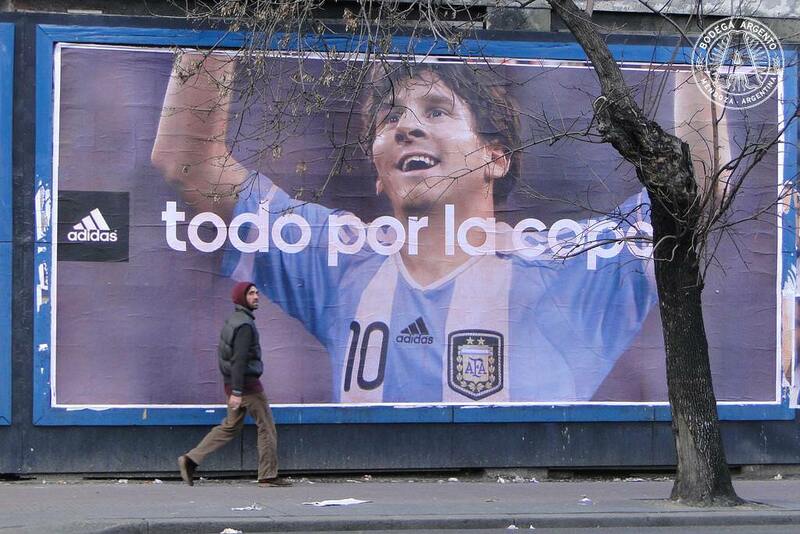 Yet, it was a rare appearance for Lionel Messi in Argentina. Born in 1987 in Rosario, a pleasant city 300km north of Buenos Aires, Messi started playing football, as does every boy at a young age. His father, Jorge, started coaching him and he remains Messi’s manager today. In 1995 – you do the maths – he started training with Newell’s Old Boys, in the youths club. Around this time he was diagnosed with growth hormone deficiency. River Plate, interested in signing the boy, offered to pay for treatment, but by this time, he had also attracted the interest on Carles Rexach, director of FC Barcelona. Messi’s father arranged a trial and they signed him on the spot and, offering to pay for his treatment, moved Leo and his family immediately to Spain. By the age of 16, he was playing in the first team of one of the greatest clubs in the world. At 17 he became the youngest ever player to score in La Liga. He got a standing ovation. Spain loved Messi and when he scored a hat-trick in El Clásico against rivals Real Madrid, well, only god-like status meets a feat such as that. The next season he scored 38 goals and Barcelona won the treble. The 2009-2010 season? 47 goals. After beating Arsenal in Champions League, Arsene Wenger compared him to a PlayStation game. His relationship with the national selección, hasn’t been quite as plain sailing. He shines, for sure, and with a line up that includes Tevez and Agüero, the World Cup team, coached by Maradona should have been a dream. It wasn’t. 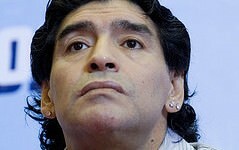 Although Maradona hailed Messi as his successor (see this goal noted for its remarkable similarity with Maradona’s most famous), his form and relationship with Maradona seemed courteous rather than close. In the 2010 World Cup he failed to score a single goal. Nevertheless, for Barcelona this year he scored his 100th La Liga goal in an 8-0 routing of Almeria and Barcelona are currently at the top of the table, closely followed by their arch-rivals Real Madrid. 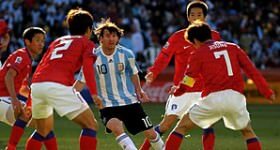 Off the pitch Lionel Messi seems almost as perfect – not that he doesn’t like to indulge in a bit of Argentina culture and enjoying few glasses of wine. He’s set on marrying the girl next door, Antonella Roccuzzo from Rosario, this month, who he has known since they were both five. Bless. Too saccharine sweet? Here they are swimming with dolphins.